A 19th century life-size finely carved Carrara marble bust of the Roman Goddess, Ceres or her Greek equivalent, Demeter supported on original carved Carrara marble column in the classical style, signed ‘S. KITSON, Fecit 18ROMA74’ (fecit translating to ‘he made’). Ceres and Demeter were Goddesses of corn, grain, harvest, agriculture and fertility, ears of corn being particularly symbolic to them. This wonderful carving depicts Ceres, her hair in Classical elaborate Roman style wearing a band of corn ears in her hair, looking beautiful wearing traditional stola (traditional Roman dress) secured with a clasp to one shoulder supported on original socle with signature to the reverse. The bust is supported by a wonderfully carved column with leaf decoration to the top leading down to a fluted column with bulbous leaf decoration and circular base. Samuel James Kitson (1848-1906) was a British sculptor born in Yorkshire in 1848, his work consisting of mainly busts and full body statues, his older and younger brothers also sculptors, his older brother John moving to the USA by 1870. Samuel worked in Rome between 1870-1874 where he was undoubtedly influenced by the wonderful works of art and sculptures around him. This sculpture has a similarity to the face to that of a Roman copy after the Greek original of Demeter which is in the Roman National Museum in Rome. 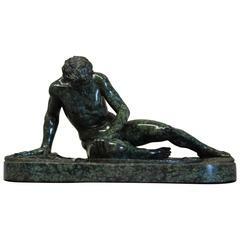 Samuel set up a studio in Italy which he maintained until 1880, by this time he had permanently moved to the USA where he worked from 1876-1906 with studios in New York, Boston and Massachusetts producing various sculptures, many for important families and buildings in the USA. He also continued to exhibit in various exhibitions in England including three times at The Royal Academy of Arts in London and twice at The Royal Manchester Institute, Manchester. This carved marble bust and column are in excellent condition and can go straight into a home or collection. Overall size including column: Height: 78'' / 198 cm Width: 21'' / 53.25 cm Depth: 15'' / 38 cm. 1990s bust of a Roman, hand carved by craftsmen using Carrara white marble for the head and travertine marble on the toga, where the white veins give movement and realism to the cloth. 1990s bust of a Roman, hand carved by craftsmen using Carrara white marble for the head and Alicante red for the toga, where the white veins give movement and realism to the cloth.